Our 12-year-old son, Evan, was diagnosed with brain cancer. Words cannot explain the feelings of helplessness, anger, frustration, and terror we felt one Thursday afternoon in late May when we were told. He has a tumor, specifically grade II astrocytoma, about 5 cm in size and it has infiltrated the deepest parts of his brain. Because of the type and location, it is not operable. The Beginning: Evan had not been able to use his left arm since November 1998, and the doctors could not figure out why. At one point we were told that Evan had a psychological problem called conversion disorder. I would not believe the doctor. Evan was 12 years old, lived with both his parents and his 2 sisters in a nice home in a small town, was on the principal honor roll, has been a Boy Scout for 8 year. Now a doctor was telling me he had a psychological problem. After a lot of doctor visits and phone calls the doctor agreed to schedule and MRI of his head and brain. May 27, 1999, started out as a typical day. The only difference was that Evan had an appointment for another MRI scheduled for 1:00 PM. I picked up Evan at school at 12:15 to go to the clinic. Evan went down to the MRI area himself, because his little sister was with us. The MRI went without any hitches. Evan and I were joking around as we left. It was early so we decided to stop at a closeout store. Again we were joking around and laughing at some of the stuff there. I remember Evan showed me a dancing naked baby statue, and we laughed and laughed. When we returned home at 4:00 PM, I checked the answering machine for messages. One message was from Evan’s doctor. I was to call immediately. I made the call to hear these words “The doctor wants to see you and your husband in the office immediately." That was when our lives changed. I knew it was not good. While trying to keep a smile on my face, I called Evan’s dad and then called some neighbors to watch the girls. After a few calls I gave up on finding a sitter and we all headed to the office. At 5:15 PM we were told Evan had a 5-cm brain tumor and because of the location it was inoperable. Evan bravely asked the doctor “Am I going to die?" The doctor answered “Instead of mowing the lawn this summer, go fishing.” The next day we had appointment with a neurosurgeon. We were told a biopsy should be done to confirm what type of tumor it was. The neurosurgeon also told us about a clinic in Houston that was conducting clinical trials and has good success with the type of tumor Evan had. The Biopsy: On June 14, 1999, I, my husband, and Evan drove 1-1/2 hours to David’s house in Lebanon, New Hampshire. David’s House is a nonprofit home, for patients receiving treatment at the medical center and their families near the Dartmouth-Hitchcock Medical Center. Evan had to be at the medical center at 6:00 AM to be admitted for a biopsy of his brain (brain surgery). The biopsy was to confirm whether or not the tumor seen on the MRIs taken 2 weeks previously were cancerous. The Biopsy Results: Evan had a 5-cm astrocytoma brain tumor in the thalamus, hypothalamus, pons, and peduncle. Conventional treatment for this type of tumor is radiation therapy, which, as we understand, is not likely to produce a cure. The radiation treatments themselves will cause a great deal of suffering and will damage the healthy brain tissue as well as the tumor. We spent countless hours researching his disease and treatment options in the hopes that knowledge will bring comfort and strength. We have decided to seek an alternative treatment owing to the promising results and minimal side effects that have occurred for many of the patients receiving it. The treatment is an FDA-approved Phase II clinical trial under the supervision of Dr. Stanislaw R. Burzynski in Houston, Texas. There is a young boy in Manchester, New Hampshire named Ryan Smith who had a virtually identical tumor. After a year of treatments received from Dr. Burzynski, Ryan’s tumor is gone. If you were in our situation, we think you would agree with our decision. Through Ryan’s success, we have hope for Evan. We celebrated Evan’s 13th birthday on July 10, and we hope to experience his 14th, and 15th, and 16th, and all the rest. We want to see him learn to drive, go to the prom, graduate from high school and college, and live a long healthy, happy life. We believe this treatment is his most promising chance for life. Evan no longer had any use of his left arm, the left side of his face was drooping, and his left leg dragged when he walked. We left for Texas on July 22, 1999. Evan started antineoplaston therapy that afternoon. Seven months later, Evan has full use of the left side of his body and the tumor has shrunk by 30%. We are so proud of Evan. After everything he has gone through, he managed to compete in the school geography bee in January and came in fourth place. Today, February 15, 2000, Evan surprised us again. When he came in from school today he had the biggest smile on his face. I looked at him and asked how the spelling bee went. He smiled and told me he came in first and he was to be in the state regional in March. 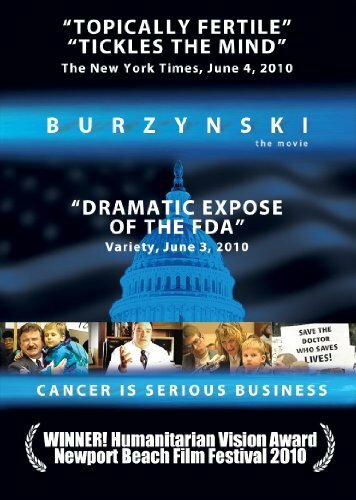 This would not have been possible if not for Dr. Burzynski. I wish I could write about a typical day in the life of a 13-year-old American teenager. My life has not been so typical since May 27, 1999. On that day, my parents and I were told I have cancer. I have a brain tumor 5 cm in size in the middle of my brain. With that said, I will describe my not-so-typical day. When I wake up in the morning, I am very, very hungry because of one of the medications I am on. I start out with breakfast and 10 pills along with 24 ounces of water. I then get dressed; my parents have to help me because the cancer tumor has made my left arm and leg very weak, to the point where I cannot use them. After I’m dressed I usually work on some homework while my mother prepares the medication for the infusion pump that I now carry around with me at all times. Occasionally during the day, I am allowed to be disconnected from the pump, which I really like to have done so I do not have to carry around my bag. (It is really a burden to carry around the pump and medication all the time.) When my mother finishes preparing the pump and medication, she then connects the tubing from the pump to the catheter that was surgically placed in my chest last summer. Once I am connected to the pump, it is turned on and the medication is delivered at the rate of 380 cc every 4 hours. The bus arrives to take me to school. When I arrive at school I first report to the nurse’s office to meet with my aide, Ms. Judy McGurk, who helps me during the school day. Then, I go to class. At 10:00 AM, I have to report to the nurse’s office to be disconnected from the pump if it is a Monday, Wednesday, or Friday. On those days, I have blood drawn so the doctors can monitor my blood chemistry. They usually check for calcium, phosphorus, magnesium, sodium, and potassium. Depending how the blood test come out the medications I take are changed. I then go back to class and finish the rest of my school day. I get home at about 3:30 PM and have a snack. After snack I rest or sleep until supper. My rest and sleep is frequently interrupted with the need go to the bathroom, which happens to be quite often, because of the amount of medication I have pumped into me during the day. After supper, I try to work on some homework, then I go to bed. Since this summer I haven’t felt like doing or been able to do much of the things I used to enjoy like riding my bike, going to Boy Scouts, camping, playing computer and video games, watching television, playing baseball, visiting friends or just taking a walk. I hope that the cancer treatment I am on will shrink or destroy the tumor and my days will be more typical again. Evan turned 20 on July 10, 2006. No signs or symptoms of the brain tumor, which once had him in a wheel chair because of paralysis of his left side. We made it through High school, getting a drivers license , 3 proms and 2 years of college.